Our 3rd Annual Quest is almost upon us! 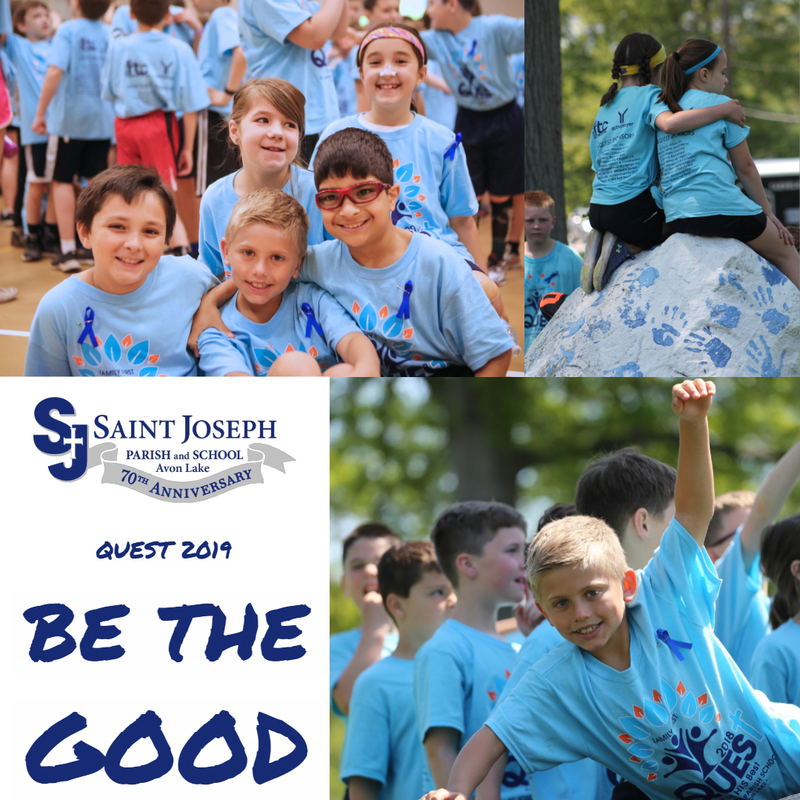 Students and faculty of St. Joseph Parish School will participate in the faith-based Rock the Challenge obstacle course and other field day events on Thursday, May 23, 2019. Parents, grandparents, and parishioners may also join us to volunteer and or visit the school grounds throughout the day. Included with the Quest fundraiser is Active Prayer, an inspired action dedicated to an intention greater than ourselves. The student body voted and chose to dedicate their efforts to "Be the Good". Quest 2019 will focus on the importance of acts of kindness. Any donation of $25 or more can be made in memory of a loved one. Please share a loved one’s name below as we will pray for them and plant a flower in their memory on the school grounds the day of Quest.All donations are tax deductible to the extent permitted by law. For donations of $150 or more, your name or your company name can be featured on the Quest t-shirts. If you would like to be a corporate sponsor, we will put your name on the back of our Quest t shirts and in the Parish bulletin! Your company will be advertised all over the place every time I wear the shirt! A donation of $250 more will make your company a gold sponsor! A donation of $150 or more will make your company a silver sponsor! Thank you from the bottom of our hearts for supporting St. Joseph Parish School and all the wonderful things Catholic education offers. form seperately for each donation. "In Memory Of" Sponsor: Any donation of $25 or more can be made in memory of a loved one. We will pray for them and plant a flower in their memory on the school grounds the day of Quest. Student Sponsor: Any donation of $25 or more can be made to sponsor a student. Silver Sponsor: If you would like to be a silver corporate sponsor by donating $150 or more, we will put your name on the back of our Quest t shirts and in the Parish bulletin! Your company will be advertised all over the place every time we wear the shirt! If you choose this level of donation, please still name one or more students to sponsor. Gold Corporate Sponsor: If you would like to be a Gold corporate sponsor by donating $250 or more, we will put your name on the back of our Quest t shirts and in the Parish bulletin! Your company will be advertised all over the place every time we wear the shirt! If you choose this level of donation, please still name one or more students to sponsor. For Student donation: Student(s) name you would like to sponsor? For Student donation: What grade is/are the student(s) you would like to sponsor? For "In Memory Of" level: What is your loved one's name? If you are a Gold or Silver Sponsor, please enter the name of the company you would like to see on the back of the t-shirt and in the bulletin!